The HoTech laser collimator separates itself from all other laser collimators with its innovative self-centering adapter technology (SCA). This mechanism allows precise and REPEATABLE installation in all brands of 1.25" and 2" telescope focusers thus provides accurate collimation. All laser collimators in the current market have one fundamental problem, slop in the adapting mechanism between the laser collimator and the telescope focuser. This problem is clearly recognized and often discussed among astronomers but so far there has been no definite solution in the market. No matter how tightly the tolerances machined on the laser collimator or the focuser, a small gap is required to allow installation of the laser collimator. Once the laser collimator is inserted, the required gap becomes a problem. A laser collimator is secured with one or more thumbscrews or unified compression ring. Both methods introduce very critical issues, namely inconsistant adaption from off-axis (axial) and none parallel-axis installment that instantly destroys the precision of your collimation instrument along the entire optical axis. Our Self-Centering Adapter cleverly eliminates the focuser slop by linearly compressing the built-in rubber rings. By doing this, the diameter of the rings expands to compensate the gap. Because all rings evenly expand radially in diameter from the compression, this automatically centers the laser collimator in the focuser draw tube. And most importantly, our SCA laser collimator can be tightly installed in the focuser for a repeatable installation to provide an accurate collimation. In summary, our SCA adapter serves three critical functions. First, its expansion rings accommodate almost all focuser's manufacturing tolerances. Second, it automatically centers the adapting laser in the focuser. Third, it provides at least two evenly distributed circular contacts on the focuser's inner tube surface preventing the adapting laser from pivoting and parallel to the focuser. Once the slop factor is taken away, you can quickly collimate your telescope in confidence to achieve perfect collimation every time. All drawtube have manufacturing tolerances. And it requires larger diameter to accept various eyepieces and adapters. When a standard collimator is inserted, the gap between the drawtube and the inserting device became a slop problem. The rubber rings in the SCA expand radially according to users own adjustment to fill the gaps. This makes your collimator seats firmly in your drawtube becoming part of your telescope for a secure and repeatable installation. The patented multiple expanding o-rings design provides solid 360 degress even grip to the inner focuser surface keeping the adapting laser perfectly parallel to the focuser tube elimating any possible tip or tilt error from the conventional thumbscrew locking mechanism. The optical axis is shifted when the inserting device is locked in by thumbscrew. In some cases, some poorly made unified compression ring can cause unstable tilt when locking in the drawtube due to loose tolerances between the compression ring, inner groove, and the uneven tip of the locking thumbscrew in a drawtube. The SCA adapts the collimator itself without using the thumbscrew or the unified compression ring. Small imperfection inside the drawtube like dents, scratches, and uneven burrs, the rubber rings compensates the errors and faithfully centers the collimator in the tube. In addition, even if the drawtube is slightly deformed in diameter, egg-shaped, the rubber rings in the SCA will compensate the differences and faithfully centers the collimator. A metal collet design will not be able to transform itself to the deformed shape to compensate the imperfection of a drawtube for a sturdy adaption. The targeting faceplate displays the returning laser spot with a clear visual reference during adjustment. That allows you to align your primary mirror from the rear of the telescope and eliminates traveling to the front of your scope repeatedly during collimation. Collimating without the targeting faceplate, you will not be able to adjust the primary mirror in real time referencing the laser dot. In other words, you often get lost on which adjustment screws you used due to traveling back and forth for referencing the direction you have adjusted. This results in considerable time to complete the collimation and defeats the purpose of quick and easy laser collimation. HoTech understands the importance of this, so the faceplate is a standard feature in our laser collimator. All astronomers deserve to have it without paying any extra! In addition, our faceplate viewer’s pattern is laser engraved to ensure a long lasting sharp targeting grid for best visual effects. Unlike other collimators, the target is not a sticker that will peel, or paint that can rub or chip off. We understand that you are paying for a precision instrument that is supposed to be well made. With our proprietary laser crosshair, user can zero-in the laser with ease during the final collimation on the secondary and the primary mirror. The crosshair model still exibits a precision laser center dot, but with a touch of four extended laser lines from the center dot. The extension lines (crosshair) of the laser dot is the most intuitive way to guide the laser pointing for an accurate adjustment. 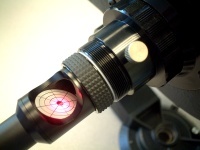 During the secondary mirror collimation, a single dot laser projecting on the approximate center of the pre-loaded donut is difficult to identify if the laser dot is exactly on the center. The crosshair laser can easily help user to adjust the secondary mirror to point the laser on the exact center with the help of the crosshair line. During the final primary mirror collimation, the returning laser dot often hides into the laser exiting hole preventing user to identify if the returning laser is at exact center of the hole. Again, the crosshair will visually guide the user to center the laser dot with ease even when the center laser dot disappears into the exiting hole. It is a very effective and essential feature to the SCA Laser Collimator in obtaining at even higher degree of accuracy with ease. Click here for a video tour on YouTube. Our laser collimator is well centered and aligned which are critical factors for an accurate collimation. But you will be surprised that many laser collimators in the market fail in this regard. The reason is in the design and understanding of the product itself. We considered all aspect of parameters in our design. Parameters like the alignment mechanism, mechanical and optical structure of the laser itself, and more are taken as part of our design. For instance, some laser collimators actually install an off-the-shelf laser pointer in the casing. It is very cost effective (for seller), but it inherits numerous problems. 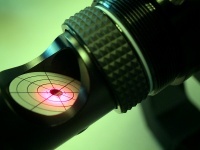 In many cases, the laser pointer might not install perfectly centered in the casing due to pointer size variations and the added alignment mechanism. So the laser itself is not positioned on the true alignment point and optical axis. As the result, the laser can never be center-aligned in the enclosure. It is possible to align the laser beam parallel to the optical path but always with an offset along the optical axis. This means the laser beam is off no matter how you center adapt the laser collimator to the focuser. The result of off-centered laser will introduce astigmatism into your telescope which is similar to figure 1's scenario. Many laser collimator manufacturers give users the wrong impression, “big and heavy means rugged and stable.” Instead, HoTech engineers successfully cut the unnecessary weight on the laser collimator because we understand that additional weight on a telescope (especially open structure Newtonians) will create imbalance and structure sagging. In addition, the heavier the device is, the more inertia it will have during an impact from an accidental drop. In such an accident, the inertia force can cause more damage to the internal alignment mechanism because there is more energy required to dissipate from the impact. Therefore, the lightweight design on our laser collimator makes you gain reliable precision collimation. And of course our laser collimator uses aero-space grade lightweight aluminum material and CNC machined with the tightest tolerances, then sand blasted and anodized to protect from harsh environment. Nothing has been sacrificed while you get a long lasting state-of-the-art collimation instrument. By using the CR123, 3V battery as our laser power source, our laser collimator has over 65 hours of continuous use battery life time. The included CR123, 3V lithium battery operates well under a typical cold night and it has a 10 years shelf life. This is a great advantage that you don't have to worry about changing the tiny hard to find cell batteries frequently in the dark like other collimators. Commercially made SCTs all have slight optical and mechanical alignment errors. The error typically is in the centering of the secondary mirror. As the result, when a laser is installed and emitted from the focuser, the beam will seldom return dead center, even though star testing would indicate perfect collimation. In addition, the secondary mirror (convex shape) expands the fine laser dot to a larger spot, and magnifies any axial error by about 5 times. The error of deviation for a typical well collimated SCT will return laser beam at around 0.125" to 0.250" off center. In order to compensate the optical and mechanical alignment errors of SCT, a different collimation approach is required in compare with Newtonain telescope. If the procedure is followed through correctly, users can still accurately collimate their SCT. By default, the laser will have to be position in the optical center of the SCT. HoTech SCA laser collimator automatically eliminates the focuser slop without using the thumbscrew and center position itself on optical axis. For SCT, the primary mirror is fixed, but you can collimate by adjusting the secondary mirror to point parallel to the optical axis. There is an one-time-only preperation you need to do for SCT laser collimation. First, install the SCA laser collimator and premark the laser position on the target grid of the collimator when your telescope is collimated from the factory or from your star collimation. Then when you check for collimation next time, just adapt the SCA laser collimator on the focuser, 2" or 1.25" and see if the laser falls on the premarked laser position. If not, adjust the alignment screws on the secondary mirror to move the returning laser dot to the premarked postion on the target grid. Due to the convex shape secondary mirror surface, the mirror will expand the returning collimating laser to a larger spot making it harder to discern the center of the return laser spot for collimation. For best result, the single laser dot laser model is more suitable for the SCT collimation for ease of finding the center of the expanded spot. See the photos below. Since our SCA Laser Collimator is already accurate with the SCA technology, fine laser dot, and the built-in 45 degrees faceplate, there is no need to use the DFG pattern to align the primary mirror of a Newtonian telescope. The purpose of using DFG pattern is to gross alignment the primary mirror. The user aligns the primary mirror by referencing the shadow of the secondary in the projected DFG pattern on a wall, and user counts the DFG dots around the shadow to center in the shadow. This method cannot achieve accurate alignment because the gap between each dot can make a big alignment difference. At the final alignment stage, the user must bring the laser dot back to the laser exit (the center of the 45 degrees faceplate). Our built-in 45 degrees faceplate allows you to align your primary mirror from the rear of the telescope eliminating traveling to the front of your scope repeatedly during collimation like other collimators. Therefore, there is no need to use DFG lens in conjunction with our SCA Laser Collimator. 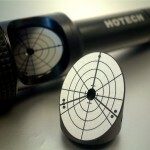 I had never used a laser collimator before, but using the Hotech laser collimator was much easier than I had imagined. I now know that it is a fantastic tool that makes it easy to keep a telescope in tip top shape for observing." Check out and download the SCA Laser Collimator User's Manual. - SCA Laser Collimator for Newtonian (PDF format). - SCA Laser Collimator for SCT (PDF format). - SCA Laser Collimator for Star Collimation (PDF format). - SCA Laser Collimator Specification (PDF format). No more guess work during the final primary mirror collimation! The crosshair laser easily guides you for a precise final collimation. The extension crosshair helps you to center the returning laser when its center dot disapear into the laser exiting hole. The crosshair also makes centering the dot on the primary mirror donut an easy task during the secondary mirror collimation. No more loose fitting laser collimators! Our patented Self-Centering Adapter cleverly eliminates the slop problem by using expanding rubber rings. As the rings expand, each ring fills the focuser slop and center positions the laser collimator in the drawtube. The SCA mechanism accommodates most brands of focusers allowing repeatable installation for an accurate collimation. We position the laser precisely in the exact optical path and align the pointing of the laser beam parallel to the optical axis. It is critical to keep the laser beam centered along the optical path for an accurate collimation, otherwise collimating with an off-axis laser beam will introduce astigmatism into your telescope. The faceplate viewer helps to display the returning laser with a clear visual reference during collimation adjustment. 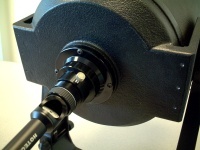 The faceplate allows you to align your primary mirror from the rear of the telescope eliminating traveling to the front of your scope repeatedly during collimation. HOTECH understands the importance of this, so the faceplate is a standard feature in our SCA Laser Collimator. In addition, the faceplate pattern is beautifully laser engraved for an excellent target view. Keeping the laser dot to the finest point is the key to precision collimation. We limit our laser beam to the finest size to operate in the correct distance for optimal visual effect. There is no guess work involved like other laser collimators which is difficult to center a large projecting laser dot to the center of the faceplate. Our understanding and experiences of the laser design permit you to have an effective and precision laser collimator. HOTECH engineers successfully cut the unnecessary weight on the laser collimator because we understand that additional weight on a telescope will create imbalance and structure sagging. The lightweight design on our SCA Laser Collimator makes you gain reliable precision collimation. And of course, our laser collimator is CNC machined with the tightest tolerances. So nothing has been sacrificed while you get a stat-of-the-art laser collimation instrument.